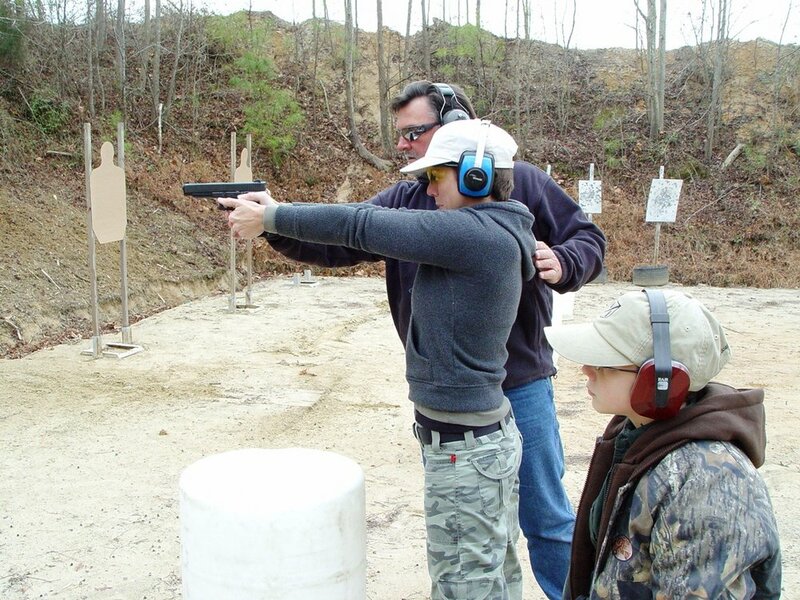 FIREARMS TRAINING Classes in Virginia.. Above: LASER DRY FIRE is a KEY Element is over coming the “FLINCHES & WHACKS” which result from too much LIVE FIRE! MASTERING IDPA & D.P.O.C. CLASSES: Become a Master of Defensive Shooting by Learning the Secrets of the Pros that will Quickly Accelerate YOUR Learning CURVE! D.P.O.C. Levels 1-5 Subjects Studied: Firearms Safety Briefing (MANDATORY on Day 1) covering our Range Protocols & Weapons Handling Policies; Proper Strong Hand Grip; Proper Off Hand Grip; Proper Stance & Presentations; Extreme Close Quarters Draw Strokes; Shooting from Prone & Supine; Shooting on the MOVE & Getting Off the Line of Attack; Proper use of Hard Cover; Shooting OVER, UNDER AROUND & THROUGH Vehicles; Shooting from OUT OF MOVING Vehicles and more! Start Time: Classes start promptly at 10:00 AM and run until 5:00 PM with a 20 minute lunch break where we will have group discussions and answer any questions you may have. Please Note: Holster & Mag pouches are NO LONGER REQUIRED for any LEVEL 1 Class. So, PLEASE DON’T BUY a holster and/or mag pouches until AFTER you attend LEVEL 1. The reason being is that 95% of our students show up the wrong holsters & mag pouches. As a result, they end up fighting the gear (holsters & mag carriers) which GREATLY hinders their learning curve. So, in LEVEL 1 class we will discuss the following: Guns, Gear, Holster & Mag Carrier selections. This will save you Time & Money! Ammo Required: 250 rounds per day MAXIMUM. Ammo Restrictions: NO HOLLOW POINTS, NO SOFT POINTS, NO FRANGIBLE AMMO ALLOWED (Full Metal Jacket or Lead ONLY). FIST-FIRE Instructor Rick Simes Double Taps Target at a TSA Match. Note how the G19 is in FULL RECOIL and there are (2) empty cases in the air. That's RECOIL CONTROL from the F.R.O.W.L. = Fully Rolled Over Wrist Lock, a trademark of the Fist-Fire System. *Please Note: It usually takes 3 DAYS (on average) to become established in Level 1 (Guard, Partial, Full Extension Shooting Positions & Roll Outs from the Open Guard). These 3 Primary Levels of Weapons Presentation are the Foundation for the Entire System. 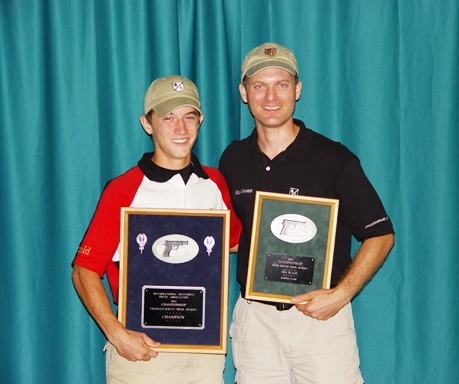 Course Description: Level 1 is the foundation of the FIST-FIRE Shooting System. Because the shooting techniques taught are so different from traditional methods (i.e., Reverse Weaver, Reverse Chapman, etc.) EVERYONE must start out at Level 1 and progress up through the System at their own pace. Once you have completed DAY 1 of LEVEL 1 you may come back for Tutorials where we teach to the needs of the class. This means we take you through the FIST-FIRE System at your own pace. No pressure, just good coaching, laser dry firing and live fire training with heavy emphasis on actual shooting technique. Subjects Studied: Firearms Safety Briefing (MANDATORY) covering our Weapons Handling Policies; The Science of Indexing & Point Shooting; Proper Grip & Wrist Lock for Maximum Recoil Control; The 3 primary levels of Weapons Presentation (Guard, Partial & Full Extension) & Roll Outs from the Open Guard. Ammo Required: MAXIMUM of 250 rounds per day of LIVE AMMO. You will however, get lots of dry firing practice in each day with lot's of coaching while using our Laser Training Devices. This is how muscle memory is built. This is how you learn to Point Shoot. This is how you develop trigger control. This is how you over come flinching, jerking and whacking the trigger. to inquire about a Class: Email us to confirm class dates and availability. PAYMENT IN FULL is required in advance to secure the class dates. We accept VISA, MASTERCARD, DISCOVER, AMERICAN EXPRESS and PayPal. we also accept payment by check. Cancellation Policy: Because class space is limited and some students may be turned away, tuition is totally non-refundable. However, if you must cancel a class (and give at least 30 days notice) you will then be allowed to attend another class at a later date (provided we can BOTH agree on the dates). Lunch: Bring a lunch and a cooler to keep it in. We have a microwave available. Or you can buy lunch at the Bacons Castle Country Store located 1 mile up the road. Course Description: Once you have completed Day 1 of LEVEL 1 you can then come back for Tutorials. This is where we teach to the needs of the individual. We will coach you all the way up through the FIST-FIRE System at your own pace. There will be no pressure, just good coaching and lot's of positive encouragement. Please Note: Because our range has numerous CQB bays, we can separate shooters of different skill levels and have them work on different things just like they do in Martial Arts classes. Length of Class: 1-5 day courses offerred. Prerequisites: Students must have successfully completed at least DAY 1 of Level 1. Start Time: Classes start promptly at 10:00 AM and run until 5:00 PM with a 30 minute lunch break where we will have group discussions and answer any questions you may have. Equipment Required: Wrap around safety Eyeglasses; ELECTRONIC Ear Protection IS MANDATORY (we recommend IMPACT PRO by Howard Leight as a minimum); A serviceable and safe handgun, a holster with (3) magazines and (2) mag carriers. Ammo Required: You will shoot NO MORE than 250 rounds per day. You will however, get lots of dry firing practice in each day with lot's of coaching while using our Laser Training Devices. This is how muscle memory is built. This is how you learn to Point Shoot. This is how you develop trigger control. This is how you over come flinching and whacking the trigger. Tuition: Cost varies depending upon class size. Scheduling a Class: Email us to confirm class dates and availability. PAYMENT IN FULL is required in advance to secure the class dates. We accept VISA, MASTERCARD, DISCOVER, AMERICAN EXPRESS and PayPal. I also accept payment by check. Registration: Registration: Go to the Menu Bar (Top Left of this page) and then slelect "Class Dates". Lunch: Bring a lunch and a cooler to keep it in. We have a microwave available. Or you can buy lunch at the Bacons Castle Country Store located (1) mile from the range. Course Description: This is our most advanced class where we bring in Instructors like Paul Sharp, Rick Simes & Kevin Apland. Subjects Studied: Handgun Strikes & Blocks; Weapons Retention/Disarms; Knife & Club Defense; Force on Force. Start Time: Classes start promptly at 9:00 AM and run until 5:00 PM with a 30 minute lunch break where we will have group discussions and answer any questions you may have. *Please Note: We will provide Laser Training Devices for your dry fire excercises. You will get plenty of repetitions in to help with the development of your muscle memory drills. Registration: Go to the Menu Bar (Top Left of this page) and then slelect "Class Dates". Length of Class: 2-5 Day courses are offerred for Level 1. Course Description: This is a Foundational Class for those who want to build a BASE on which to run the AR-15/M4 platform from 3 to 100 yards. The course is by design, a DEFENSIVE SHOOTING COURSE that is intended to enable you to protect and defend your home and loved ones. It’s designed primarily for civilian or solo use, so there’s no Team Tactics involved and it's not physically demanding. In this class we run "SLICK" (i.e., NO KITS (tactical vests). Slings are allowed and recommended. AR mag carriers ARE ALLOWED on the BELT (but NO chest rigs are allowed). Pistols ARE NOT ALLOWED unless you have successfully completed a MINIMUM of 3 DAYS fo FIST-FIRE LEVEL 1 Pistol. Subjects Covered in Level 1: Proper Loading and Unloading; Malfunction clearances; Proper Grip & Stance; Mounting and Presenting the weapon. Equipment Required: Safety Eye Glasses; Electronic Ear Protection IS MANDATORY; Baseball cap; Serviceable and Safe Carbine or SBR with (300) rounds of Ball Ammo (MINIMUM) per day (NO HOLLOW POINTS, NO SOFT POINTS, NO TRACER ROUNDS) and at LEAST THREE (30 round) magazines. NOTICE: We DO ALLOW .22LR conversions “in lieu of or in addition to” the center fire ammunition needed for this class. Start Time: Classes start promptly at 10:00 AM and run until 5:00 PM with a 30 minute lunch break. Scheduling a Class: Email me to confirm class dates and availability. PAYMENT IN FULL is required in advance to secure the class dates. We accept VISA, MASTERCARD, DISCOVER, AMERICAN EXPRESS and PayPal. I also accept payment by check.nd PayPal.